Presented at SIGGRAPH 2014 in Vancouver as a poster session. 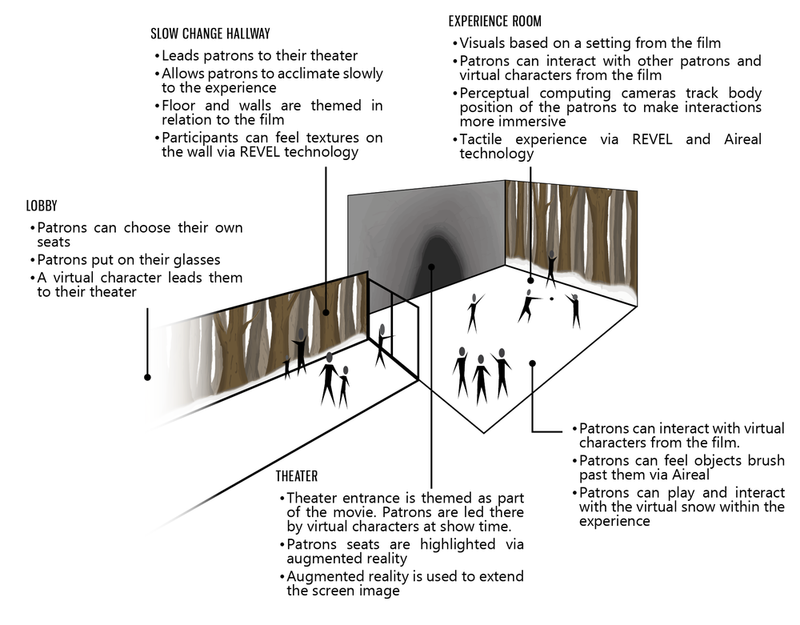 The Augmented Reality Theater is our concept for a new movie theater experience for 5-10 years into the future. This design leverages augmented reality glasses, perceptual computing cameras, AirReal and REVEL technologies to create an immersive lobby experience for our patrons. We began from a prompt from the CHI 2014 Student Design competition that focused on the Quantified Self. Body data trackers were emerging at this point, and they asked the question "How can we produce knowledge from this data?" Movie theaters only offer immersion within the theater itself. We explored an industry focused solution, before refocusing on improving immersion within the theater itself. We realized that there was an opportunity to improve the movie theater experience by enhancing immersion outside the movie theater itself. We found immersion to be the most interesting problem in the movie theater space, so we built our personas and ideas around improving immersion. This concept explored using biometric data to determine how the audience was feeling, and then alter the movie based on that feedback. Hospitals can use patches to track patients vital statistics wirelessly, cutting down on hardware. We explored the use of these as a non-invasive way to gather patron data. This concept was intended for film reviewers or students. These glasses would be connected to a small keyboard. Their notes would be displayed in the glasses, allowing them to keep their eyes on the film as they typed, rather than look away. A small camera was considered as a way to view the keyboard to orient the user. An early version of the concept that eventually became our solution. We called these "VR glasses", before learning more about the technology. Goal - We first assumed we would need to track patrons experience, so we began by finding technology that could allow us to do this without using excessive hardware. After researching various technologies that could be worn in the movie theater without causing a distraction, we began creating several concepts around a sticker that hospitals use to track vitals on patients without wires. Result - After interviewing people with experience doing this kind of work, we learned that our expectations for what kind of data could be gained through this method was minimal. We moved onto other concepts. Goal - Once we decided that gathering live data from moviegoers wouldn't be feasible, we decided that rather than change the movie, we could enhance it. We began looking for ways to do that in the existing space. Result - We chose Augmented Reality as our platform to give the patrons the freedom to move around the space freely, while adding virtual characters and environments. Goal - We needed to decide where in the theater space this experience would occur. An early version of the concept occurred within a single lobby. All patrons would share a single space and see characters from their own film appear while not seeing characters from other films. Result - We realized after a critique session that this was not workable for safety and immersion purposes. We decided to create separate spaces for each theater. We diagrammed the space with a 4 theater concept to ensure that separating the theaters with long hallways would be possible. Our diagram of how a main lobby could serve 4 theaters with slow-change hallways connecting each. Goal - We needed to find technology that could feasibly produce the experience we had envisioned. Result - After further research, we discovered the AirReal and REVEL technologies, and the final design came into focus. Using these technologies our design moved from a simple overlay of an existing space into a fully immersive experience. Because the technology is still years away from being commercially viable, we defined this experience for 5-10 years into the future. This project was the most successful project of the first semester of my Master's program. Externally, we received recognition from SIGGRAPH, being invited to present a poster. But internally, I personally learned a lot about how to work in a team with strong personalities, defer my own ideas for the greater good of the group, and think deeply into a design, following insights into iterations. Answering the original question "How do we produce knowledge from this data? ", we focused on the movement of the users in the space, learning how to turn their motions into interactive experiences with virtual characters. I also learned a lot about Augmented Reality technologies which leads into my current work on Augmented Reality in museum spaces.